Our company serves in the field of nutrition and health for animals and humans since 1996. 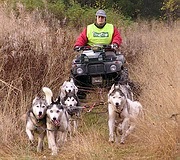 Now we have expanded our range of services from internet shop, specialized in sleddogs and health products, to offering unique outdoor activities on our Nordic Husky Farm in Swedish wilderness. We are located 40km NW of Strömsund, Jämtland, about 35min. drive from town. Our remote setup on the beautiful banks of Vattudalen lake is an ideal place to spend late spring, summer or early autumn days far away from duties and stress of daily life. You can come and join us on one of our exciting outdoor adventure tours, or you can rent your own room for several nights and plan your own vaccation in the area. The 18 years of mushing, breeding & working with siberian huskies led us to share our experiences in the field of training, equipment, feeding and taking care of sleddogs. We are glad to offer help, advice and basic training to beginners. Our winters last as long as seven months and our well-groomed snowy trails offer ideal training possibilities for those of you who want to enjoy real nordic winter with your own sleddogs. 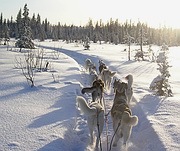 Our trail system is suitable for recreational, sprint, mid and long distance mushers, and connect directly from our dogyard to the mountains.